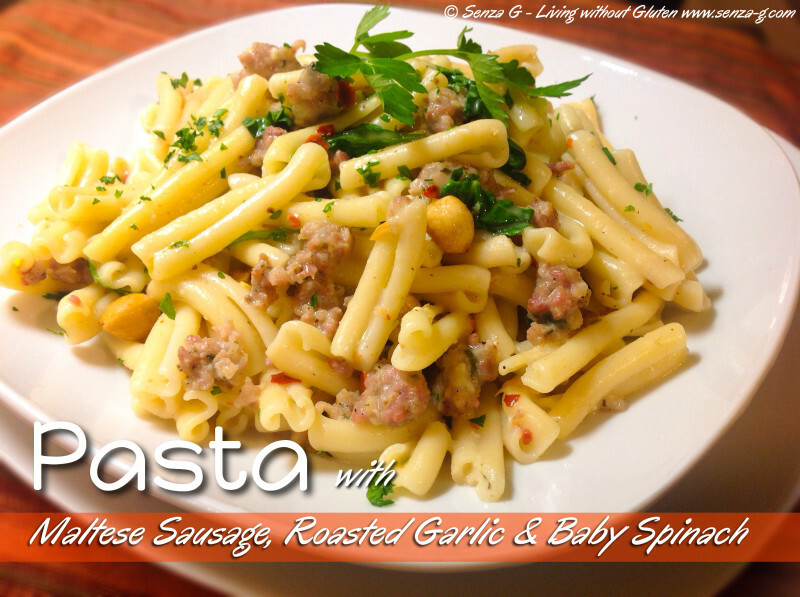 This recipe is made with our Maltese Sausage. It does taste different than other sausages. It is laced with coriander seeds and tastes divine! We Maltese, at least myself even eat it raw! I cannot guarantee that this recipe will come out the same if you use other sausages, but you can always try! You can omit the nuts, but I love a bit of crunch! Put the garlic cloves in a piece of foil, drizzle with a little oil, sprinkle some salt, close the foil around the cloves and place in a preheated oven (150C) for about 30 to 40 minutes. Take out and leave to cool. In a pan, sauté the onion in a little olive oil till it softens, add the crumbled Maltese sausage and cook till it browns lightly. Mash the garlic cloves and add to the sausage mix, combining well. Add the white wine and the GF stock powder and cook until the liquid is almost absorbed. In the meantime, boil the pasta until al dente, drain but reserve some of the pasta water. Add the panna to the sausage mix, combine and add some of the reserved pasta water to thin it down slightly. Add the Chilli if using and a dash of nutmeg. Season with salt and pepper and add the baby spinach leaves, cooking until they wilt. Add also some freshly chopped parsley. Add the pasta to the sauce and combine gently. Throw in the roasted nuts if using. Serve immediately, garnished with some parsley leaves.